Students must have an edX Edge account. You must use the same email address they used for their edX Edge account when you enroll them in your course. At the beginning of your course, you may want to send students an email with your course information, including how to register for their edX Edge account if they do not already have one. The sample email shown below contains the necessary information. Please update and personalize, as you feel necessary. Welcome to [insert course name]! Hello everyone, my name is [Insert your name] and I am going to be your instructor for [insert course name]. This course will be using the edX Edge platform to support our teaching and learning goals. If you have not already done so, you must register for your own edX Edge account at https://edge.edx.org/register before you can be enrolled into the online course. If you have already registered for an edX Edge account with a prior course, you do not need to create a new account. However, please note that registration on the edX Edge platform is different than registration you may have completed if you enrolled in a MOOC on edX. Even if you have previously taken an edX MOOC, you still need to create an account with edX Edge. After registering for an edX Edge account, you should see [course name] listed on your dashboard after signing in at https://edge.edx.org/. If you do NOT see the course on your dashboard, please send the email address you used to register for your edX Edge account to [your email here]. If you need technical assistance for any reason, please contact the IT Service Desk at [insert email and phone number]. The enrollment process (what you will do) is described below. Before you begin, if you are logged in using any other account than your instructor username for this course, please sign out of edge.edx.org. 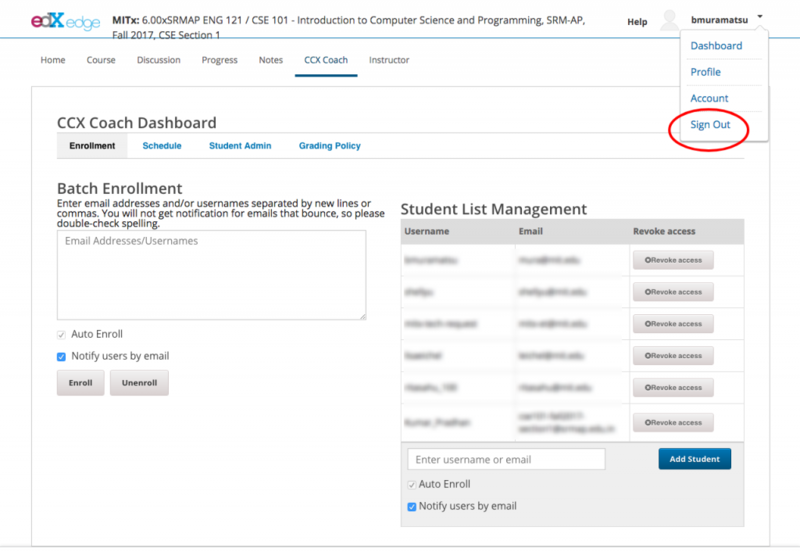 Login onto https://edge.edx.org with your instructor account using the email and password you used when you created your CCx course. From the My Courses page, find the course for which you would like to enroll students and click on the View Course button to enter your live course. Select CCx Coach tab from the list across the top of the page. 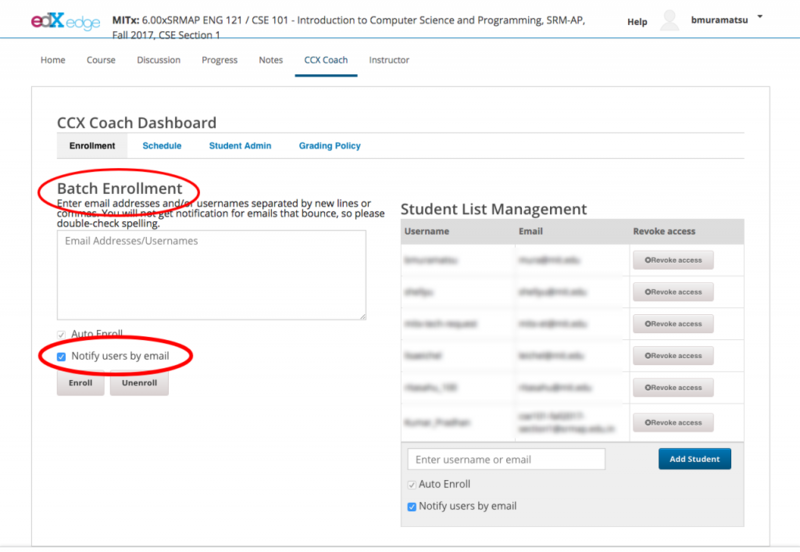 You can enroll students using the Batch Enrollment function on the left side of the page, or individually. We recommend using Batch Enrollment to add your entire class at once. To do so, enter the email addresses of your students separated by commas or new lines. We suggest you leave the Notify Students by email checkbox selected. This will prompt the system to automatically send your students one of the two emails described below. You cannot change the contents or personalize either of these automatically generated emails. If the student is already registered for an edX Edge account, they will receive an email notifying them that they have been enrolled in your course with a link to your course. If the student is not registered for an edX Edge account, they will receive an email that invites them to register for an edX Edge account and after doing so, they will automatically be enrolled in your course. If you do not check the Notify students by email checkbox, your students will receive no information about the course unless you send it to them. If they have already registered for an edX Edge account, they will see the course on their dashboard after you enroll them. If they have not registered for an edX Edge account, they will not receive any reminder to do so. Once you have finished entering your student email address, click on the Enroll button. If students have already registered for an edX Edge account, you should see their names appear in the Student List Management section on the right side of the same screen. If students have not yet registered for their edX Edge account, as stated above, they will automatically receive an email asking them to create their edge account. After they create their account, you will then see their name and email address in the Student List Management section.